“Rose…got something to tell you.” A prolonged silence invades the stage at the McCarter theatre center where “Fences” is being played. An audible gasp rebounds from the spectators. Directed with the able hand of Phylicia Rashad, the artistic direction of Emily Mann and staring Esau Pritchett as Troy, Portia as Rose, Phil McGlaston as Bono, Jared McNeill as Lyons, G. Alverez Reid as Gabriel, Chris Myers as Cory and Taylor Dior as Raynell, “Fences” will be at the McCarter theatre center in Princeton, New Jersey, until February 9th. 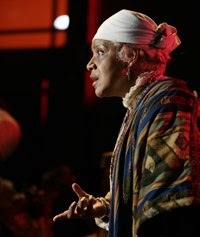 Wilson was the fourth of six children of a white German father and an African-American mother and saw theatre as a means for raising Afro-American cultural consciousness. 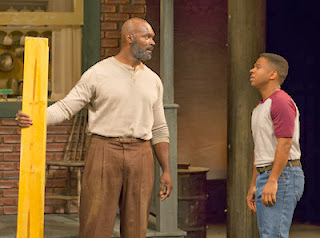 “Fences” was his second play to move to Broadway and won the Pulitzer Prize for Drama in 1987. 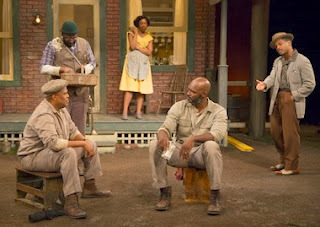 The play takes place in the Pittsburgh Hill District in 1957. It is a bitter-sweet slice of life, a story told with simple but eloquent words, mixing humor and every day life with an almost Shakespearian sense of drama. Troy Maxson was born to a sharecropper father who was frustrated because every crop took him deeper into debt. That feeling was transmitted to his son, Troy and to Troy’s family. He is not a hero, there is violence in him, but he has learned the value of work and the need to take responsibility for his actions. But in racist America the chances for a black man are still distant. “You’ve got to take the crooked with the straight,” he says. But he has his weakness. He has been messing around with another woman. He has made her pregnant. “Where was ‘we’ at when you was down there rolling around with some godforsaken woman?” Rose wants to know. The January 12th performance received a well merited standing ovation. The acting, setting, costumes, lighting…all contributed to a noteworthy theatrical event.